Sakya is one of four major schools (Nyingma, Sakya, Kagyu and Gelug) in Tibetan Buddhism (Vajrayana). It takes its name from the monastery founded at Sakya in south-western Tibet in 1073 by Könchok Gyalpo of the Khön clan. Sachen, the first of the five supreme Masters, received a wealth of tantric doctrines from numerous Tibetan translators or ‘lotsawas’ who had visited India, most importantly Drokmi Lotsawa, Bari Lotsawa and Mal Lotsawa. From Drokmi comes the supreme teaching of Sakya, the system of Lamdre (lam ‘bras) or ‘Path and its Fruit’, deriving from the siddha Virupa (Birwapa/Birupa) and based upon the Hevajra Tantra. Mal Lotsawa introduced to Sakya the esoteric Vajrayogini lineage known as ‘Naro Khachoma’. From Bari Lotsawa came innumerable tantric practices, foremost of which was the cycle of practices known as the ‘One Hundred Sadhanas’. Other key transmissions that form part of the Sakya spiritual curriculum include the cycles of Vajrakilaya, Mahakala and Guhyasamaja. The fourth Sakya patriarch, Sakya Pandita, was notable for his exceptional scholarship and composed many important and influential texts on sutra and tantra, including, ‘Clarifying the Thought of the Sage’ and ‘Discriminating the Three Vows’. The Bodong and Jonangpa also had strong links to Sakya. In the early 14th century the monk Sherab Gyeltsen broke away from the Sakyapa school and established the Jonangpa school at Jonang, about 160 km northwest of the Tashilhunpo monastery in Shigatse, There, the Jonangpa built a large monastery and constructed a printing press. The Jonangpa school had generated a number of renowned Buddhist scholars, the greatest of whom was Taranatha (1575-1634). Taranatha placed great emphasis on the Kalachakra system of tantra which became an important part of Gelugpa teaching after the Gelugpa absorbed the Jonangpa monasteries. In 1264 the feudal lordship over Tibet was given to Phagpa by the Mongolian emperor, Kublai Khan. Sakya lamas continued to serve as viceroys of Tibet on behalf of the Mongol emperors for nearly 75 years after Phagpa’s demise (1280), until the Emperor of China subjugated the Mongols. The head of the Sakya school, known as Sakya Trizin («holder of the Sakya throne»), is always drawn from the male line of the Khön family. 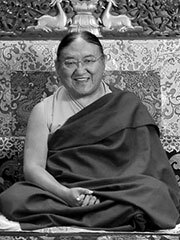 The present Sakya Trizin, Ngawang Kunga Tegchen Palbar Samphel Wanggi Gyalpo, born in Tsedong in 1945, is the forty-first to hold that office. His Holiness resides in Rajpur, India. During the 19th century the great Sakya master and terton Jamyang Khyentse Wangpo, the famous Kagyu master Jamgon Kongtrul Lodro Thaye and the important Nyingma terton Orgyen Chokgyur Lingpa founded the Rime movement, an ecumenical attempt to incorporate all teachings of all schools, to overcome the separation of Buddhist transmission in different traditions. This movement still influences modern Tibetan Buddhist practice through the «five great treasures» of Jamgon Kongtrul and the treasure of rediscovered teachings (Rinchen Terdzöd). Jalpo entry by Geir Smith, (a Ngor Phende religious) about the Sakyapa deity, which deity is now the centre of controversy and furor within the Gelugpa schools, and that was forcibly used to divert the Sakyapa lineage of reincarnation of the deity. The Sakyapa role in this can calm the conflict and bring both it and the Jonang banning (below) issue to closure. Jonang entry about the banned Jonang sect of Sakya forcibly converted to Gelug by the fifth Dalai-Lama in the 17th cent. Kalachakra entry about the deity that shows it’s Sakyapa nature, being the tradition of the banned Jonangpas that the Gelugpa forcibly took over.